Preheat oven to 425°. Toss first 5 ingredients in a large baking dish. Season with salt and pepper. Spread out in an even layer. Bake tomato mixture for 5 minutes. Season fish with salt and pepper. Arrange fish in a single layer over tomato mixture. Roast fish with tomato mixture until fish just begins to flake, about 10 minutes. 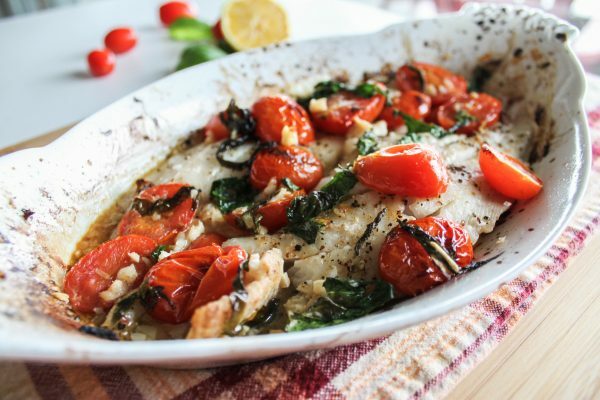 On your recipe for Baked Flounder with Tomatoes and Basis, your instructions indicate mixing together the first five ingredients. However you do not mention or post what these are. 2. Bake tomato mixture for 5 minutes. Season fish with salt and pepper. Arrange fish in a single layer over tomato mixture. Roast fish with tomato mixture until fish just begins to flake, about 10 minutes. Please indicate all the ingredients. Thanks for catching our error. We have updated the recipe. We hope you enjoy it. Its a good one!